Households perceive that the value of their home rose in November, according to the House Price Sentiment Index (HPSI) from Knight Frank and Markit Economics. Some 22% of the 1,500 households surveyed across the UK said that the value of their home had risen over the last month, while 5.2% reported a fall. This gave the HPSI a reading of 58.4 (see figure 1), the twentieth consecutive month that the reading has been above 50. However, while a positive balance of households perceived that the value of their house rose in November, the reading was the lowest recorded by the index in 12 months indicating that households are less confident that the value of their property has risen than at any time during the last year. Any figure over 50 indicates that prices are rising, and the higher the figure, the steeper the increase. Any figure below 50 indicates that prices are falling. And while households in all 11 regions covered by the index reported that prices rose in November, the rate of growth was perceived to have been slower than the previous month in eight of these regions. 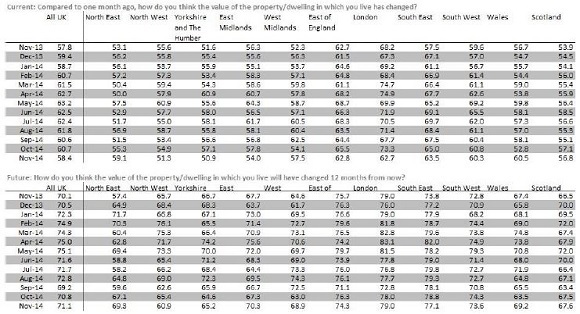 In London the proportion of households reporting that the value of their property rose in November was 62.7, down from 73.3 the previous month and the lowest reading for households in the capital since June 2013. Since the inception of the HPSI, the index has been a clear lead indicator for house price trends. Figure 2 shows that the index moves ahead of mainstream house price indices, confirming the advantage of an opinion‐based survey which provides a current view on household sentiment, rather than historic evidence from transactions or mortgage market evidence. 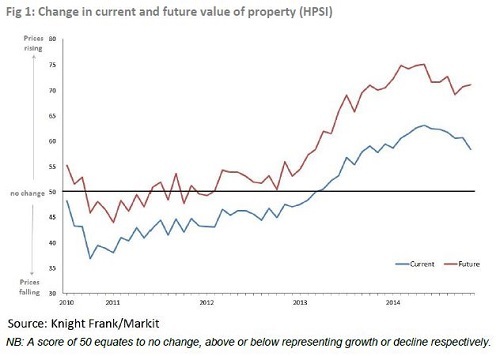 The future HPSI (figure 1), which measures what households think will happen to the value of their property over the next year, rose in November to 71.1, up from 70.8 the previous month. Households in London (79.0) are most confident of future price rises, followed by those in the South East (77.1) and in the East of England (74.3). Conversely, households in the North West (60.6) and in Yorkshire (65.2) expect a slower pace of growth. Mortgage borrowers were the most confident that prices will rise over the next year (77.6), perhaps buoyed by lower mortgage rates, followed by those who own their home outright (75.7). But, while households are confident that the value of their home will rise in the next 12 months, the future HPSI remains below its peak of 75.1 achieved in May this year. Some 5.5% of UK households said they planned to buy a property in the next 12 months. This is down from 6.2% in October. Looking at the figures on a regional basis reveals that 7.9% of households in London and in the North East plan to purchase a property in the next year, compared to just 1.6% in the East Midlands. Individuals aged between 25 and 34 are more likely to be considering buying a home in the short term, with 7.6% of such respondents saying they planned to purchase a home within the next 12 months compared to 3.8% of respondents aged 55 and above. “House price sentiment remains strong in comparison to its post-recession trend, but our November survey highlights an accelerated retreat from the peaks seen during the first half of 2014. “The latest figures indicate the sharpest month-on-month slowdown for just over three years, led by a decisive shift in momentum across London. The Knight Frank/Markit House Price Sentiment Index (HPSI) survey was first conducted in February 2009 and is compiled each month by Markit. The survey is based on monthly responses from approximately 1,500 individuals in Great Britain, with data collected by Ipsos MORI from its panel of respondents aged 18-64. The survey sample is structured according to gender, region and age to ensure the survey results accurately reflect the true composition of the population. Results are also weighted to further improve representativeness. Prior to September 2010, the Household Finance Index was jointly compiled by YouGov and Markit based on monthly responses from over 2,000 UK households, with data collected online by YouGovplc from its representative panel of respondents aged 18 and above. The panel was structured according to income, region and age to ensure the survey results accurately reflected the true composition of the UK population. Results were also weighted to further improve representativeness. Index numbers are calculated from the percentages of respondents reporting an improvement, no change or decline. These indices vary between 0 and 100 with readings of exactly 50.0 signalling no change on the previous month. Readings above 50.0 signal an increase or improvement; readings below 50.0 signal a decline or deterioration. IpsosMORI interviewed 1,500 adults aged 18-64 across Great Britain from its online panel of respondents. Interviews were conducted online between 12 – 17th November 2014. A representative sample of adults was interviewed with quota controls set by gender, age and region and the resultant survey data weighted to the known GB profile of this audience by gender, age, region and household income. Ipsos MORI was responsible for the fieldwork and data collection only and not responsible for the analysis, reporting or interpretation of the survey results. Knight Frank LLP is the leading independent global property consultancy. Headquartered in London, Knight Frank and its New York-based global partner, Newmark Knight Frank, operate from 244 offices, in 43 countries, across six continents. More than 6,840 professionals handle in excess of US$755 billion (£521 billion) worth of commercial, agricultural and residential real estate annually, advising clients ranging from individual owners and buyers to major developers, investors and corporate tenants. For further information about the Company, please visit www.knightfrank.com. For the latest news, views and analysis on the world of prime property visit Knight Frank's new website Global Briefing at http://www.knightfrankblog.com/global-briefing/. And follow us on twitter @kfglobalbrief and @knightfrank. The intellectual property rights to the HPSI provided herein is owned by Markit Economics Limited. Any unauthorised use, including but not limited to copying, distributing, transmitting or otherwise of any data appearing is not permitted without Markit’s prior consent. Markit shall not have any liability, duty or obligation for or relating to the content or information (“data”) contained herein, any errors, inaccuracies, omissions or delays in the data, or for any actions taken in reliance thereon. In no event shall Markit be liable for any special, incidental, or consequential damages, arising out of the use of the data. Markit and the Markit logo are registered trademarks of Markit Group Limited.